ST. GEORGE – The pressure of federal action against St. George businessman Jeremy Johnson, his I Works corporation, family, friends and associates has steadily increased on several fronts, especially this week. On Wednesday, United States attorneys filed a superseding indictment in the criminal action before Utah’s central district of the United States District Court, an action first brought in June 2011 for mail fraud. The indictment charges Jeremy Johnson, his I Works corporation and four former employees of I Works with 86 criminal counts, including conspiracy, false statements to bank, a variety of fraud counts and money laundering. Added to the criminal action are Scott Leavitt, Bryce Payne, Ryan Riddle and Loyd Johnson. More criminal charges, more parties to be added? On Thursday, U.S. prosecutors responded to arguments against its request for a gag order in the criminal case. The requested gag order is opposed by both Johnson and the Utah Association of Criminal Defense Lawyers through a “friend of the court” filing. The gag order contest stems from prosecutors seeking to stop Jeremy Johnson and his attorneys and unnamed persons who may not know they are a potential witness from talking to media, advancing his case via social media such as Facebook and YouTube. The prosecution made its motion for a gag order in the wake of publicized allegations that Utah’s now Attorney General John Swallow was involved to some degree in a scheme to influence – whether through consulting, lobbying or bribery – federal prosecutors to back down from their prosecution of an FTC civil action against Jeremy Johnson and others. It is argued by the prosecution, among other things, that these public communications might impair a fair trial; in other words, taint the jury pool. The objectors argue that the requested gag order is overbroad and constitutionally improper. The court has yet to rule on the prosecution’s request. On Feb. 25, an amended complaint was filed in the FTC civil action against Jeremy Johnson and multiple defendants, started in December 2010. The amendment has now brought Johnson’s family members into the case as defendants along with associated entities: Sharla Johnson, Barbara Johnson, Kerry Johnson, KB Family Limited Partnership, KV Electric, Orange Cat Investments and Zibby, LLC. On Thursday the appointed receiver over assets of Jeremy Johnson and others associated with the civil action brought by U.S. attorneys in the Nevada district of the U.S. District Court – an action on behalf of the FTC against Jeremy Johnson and a host of defendants – sought an emergency order to show cause. The receiver seeks to hold a law firm and its individual attorneys and Jeremy Johnson’s wife, Sharla Johnson, and a Johnson-related entity, Zibby, LLC., in contempt of court, to rescind a transfer of the Johnson residence, familiarly known as the Johnson mansion in St. George, and to enjoin sale of the mansion. The receiver’s issues arise in response to the Johnson mansion, located at 529 South Woodsview Circle in St. George, being transferred by a Feb. 1 quit claim deed from Sharla Johnson and Zibby to the law firm of Christensen and Jensen, recorded on Feb. 11. 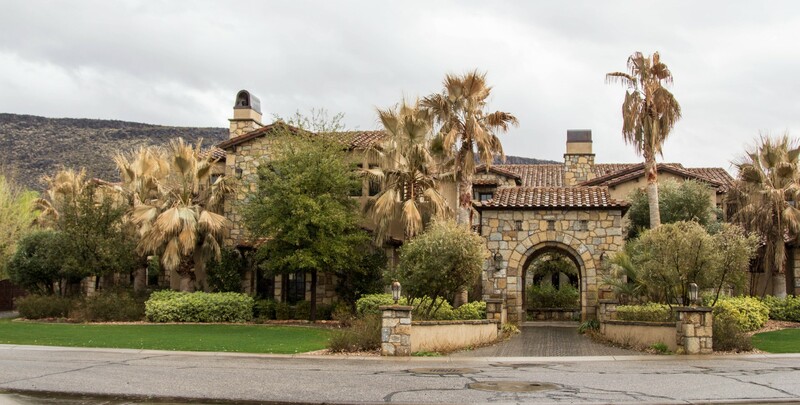 The property is now listed by Coldwell Banker for sale at $9 million. The Christensen law firm’s opposition to the receiver’s request rejects, among other things, the claim that the transfer was received in payment of legal fees. The Christensen firm argues its representation of entity defendants in the FTC action is on a contingency basis. The Court granted the requested Order to Show Cause and set a hearing on the matter for April 29. On Thursday, the prosecutor in the FTC action held in Nevada filed a reply to Jeremy Johnson’s objections to FTC requests for sanctions against him. The FTC seeks to preclude Jeremy Johnson from using in his defense any documents he has yet to produce in response to the prosecution’s discovery requests and to strike any of Jeremy Johnson’s responses to requests for admissions and written questions because they were allegedly not signed. These kinds of discovery requests, production of documents asking a defendant to admit to certain statements, answer certain questions, are typically designed to prove required elements of a case necessary to win judgment. If the prosecution’s requested sanctions are granted, the damage to Jeremy Johnson’s defense could be significant if not fatal. Depending upon the extent of admissions that could be deemed made, the prosecution may stand a chance of obtaining summary judgment without Jeremy Johnson having the benefit of a trial on the case’s merits. Court pleadings claim that consumers were told they could help reduce debt, stop foreclosures, help with home business startups, pay utility bills and even buy Christmas presents, among other things. The way clients accessed the grants was through a free CD said to contain “everything you need to know to obtain your government grant.” Consumers just had to pay $2.29 for the shipping cost. The government actions allege that consumers discovered the CDs were not what they expected and that their credit and debit cards were being charged – not only for the shipping fees, but a monthly membership fee as well. The excessive charge-backs would lead banks to shut down I Works merchant accounts; yet, as the criminal indictment alleges, Jeremy Johnson had a series of shell companies created in which new accounts were created in order to continue charging consumers. These shell companies were often created with the cooperation of friends and family, who may have been naîve to the alleged fraudulent nature of the scheme. Consumer complaints, coupled with an excess of credit card charge-backs against I Works, led to the company and Jeremy Johnson being investigated by the FTC in 2009. A civil matter complaint was filed against Jeremy Johnson and multiple defendants in December 2010 on ten counts of misrepresentation, failure to disclose and other consumer fraud and injury counts, with requests for injunctive relief. The amended complaint mentioned in this report increases the scope of the lawsuit, involving Jeremy Johnson’s family members. A receiver was appointed by the federal court in Nevada in January 2011, freezing assets of Jeremy Johnson and associated defendants, later liquidating some of those assets. The Johnson mansion mentioned above in this report is claimed to be subject to that receivership. A single criminal charge of mail fraud was first brought in 2011, with Jeremy Johnson incarcerated for some months before being released on bail. Settlement discussions were had between Jeremy Johnson and the criminal prosecutor in 2012, arriving at a proposed plea agreement in which Jeremy Johnson would plead guilty in exchange for the prosecutor’s promise to forego action against a list of friends, family, and associates of Jeremy Johnson. According to a Jan. 14 email communication from friend of Jeremy Johnson, Jason Peterson, stating that Jeremy Johnson told him St. George News was interested in his case and offering observations, prosecutor Brent Ward offered the plea agreement to Jeremy Johnson sometime around September 2012. Peterson said that Ward prepared what has become known as the “Hit List,” and supplemented it per Jeremy Johnson’s request shortly aftward. “Brent Ward then put language in the plea agreement, which would cover everyone on both lists (including John Swallow),” Peterson wrote; parentheses his. “In the hearing when Jeremy brings up the list, Brent Ward initially denies any knowledge of any list. When Jeremy tells Judge Nuffer the list was provided by Ward and produces a copy, Ward sheepishly admits it was his ‘Hit List’ and agrees to make it a part of the record. When they were about to also add Jeremy’s supplemental list, some guy comes up from the audience and starts talking to Ward and there is clearly some disagreement on the lists. This is when the judge calls a recess so they could work it out. 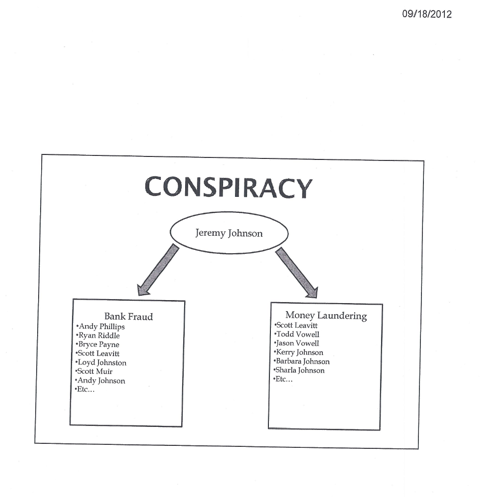 Among the fallout from the plea agreement hearing, which ended short, came allegations of Swallow’s connection to Jeremy Johnson, tying Swallow to a bribery or other scheme involving Nevada Sen. Harry Reid, designed to end the FTC civil proceeding against Jeremy Johnson. In a Feb. 14 letter to U.S. Attorney David Barlow, Swallow made specific denial of ever participating in a scheme to bribe a member of Congress; it did not deny other involvement and urged Barlow’s office to look into the allegations. “As for Swallow not knowing about being on the list, this is absolutely not true. He very well did know and was grateful. He never asked me or Jeremy or anyone to take him off the list. Lots of people knew including Shurtliff, Swallow’s attorney, Jeremy’s attorney, etc. I saw the email that Jeremy sent to Swallow with Ward’s plea deal and the attached lists to assure him he was covered. Nobody ever asked to remove him from the list. St. George News Assistant Editor Mori Kessler contributed to this report. Jeremy Johnson’s friend, Jason Peterson, has the same credibility as Jeremy – none. His story about Brent Ward and the “hit list” is ludicrous in the extreme. The most hilarious part is his claim about the “mountains of evidence” that proves Jeremy is not guilty. I have read all of the complaints and the receivers reports and I have just one question for the Jeremy apologists. What was the purpose of the now 300 companies that friends and associates set up. No one to my knowledge has ever explained their purpose which, to me, is clearly an obvious ruse to continue operations after IWorks could not function because of mountains of chargebacks from credit card companies. Remember it is a grand jury that handed down the new charges. I found you again Karen! (If that’s really your name). You ARE that receiver mole living right next to Jeremy! I would seriously consider changing your alias, people are catching on to you. | Wed Jan. 30, 2013 7:26 AM PST23.Senate Majority Leader Harry Reid (D-Nev.) Utah may be best known for its clean-living, teetotaling Mormon culture, but the state has long had a reputation as the home for less savory activity: financial fraud. Long known as the “scam capital” of the world, Utah has the dubious distinction of producing large numbers of con artists, penny stock scammers and other charlatans—so many that the Securities and Exchange Commission has an office in Salt Lake City (which is unusual for the agency). Yet another one of these sordid stories is underway in the state right now, and this time, an accused scammer has said he tried to bribe a big name: the highest ranking Democrat in the US Senate, Sen. Harry Reid (D-Nev.), himself a Mormon with many ties to Utah. After he was indicted on bank fraud and money laundering charges, Johnson came to the Salt Lake Tribune with a bizarre allegation: He claimed that in 2010, when the FTC was investigating iWorks, he tried to bribe Reid, whom he thought could make the FTC investigation go away. Johnson said the scheme was the idea of John Swallow, a Republican and Utah’s newly elected attorney general. Johnson had sought Swallow’s help fending off the FTC, and according to Johnson, Swallow, a former lobbyist for a Provo-based payday loan operation, persuaded him that his best chance was a well-placed bribe. Swallow, Johnson said, initially wanted $2 million but settled for $600,000 for Reid. Swallow put Johnson in touch with Richard Rawle, a Reid donor who owned the payday loan company for which Swallow had lobbied. Rawle, now deceased, supposedly bragged to Johnson that Reid had helped him successfully beat back payday loan regulations. Johnson claimed he paid about $300,000 to a shell company set up by Rawle, with the understanding that it would be used to enlist Reid’s help in squashing the FTC investigation. Not long afterward, the FTC sued Johnson. His assets were frozen and he was arrested in the Phoenix airport en route to Costa Rica, and charged with mail fraud. Clearly unhappy with the turn of events, Johnson said he demanded that Swallow return his bribe money. When the money wasn’t forthcoming, Johnson went public with his allegations—shortly after Swallow took office this year. Johnson provided the Salt Lake Tribune with a host of financial records and emails allegedly documenting his exchanges with Swallow. The allegations of bribery by Mr. Johnson, a man with a background of fraud, deception and corruption, are absurd and utterly false. Bribery is a crime for which Senator Reid has personally put people behind bars. Senator Reid will not have his integrity questioned by a man of Mr. Johnson’s low record and character, and his outrageous allegations will not go unanswered. Clearly, a desperate man is making things up. The story gets weirder. The Tribune tracked Johnson’s money trail to a law firm associated with Jay Brown, a Las Vegas lawyer and payday loan industry lobbyist whose name has repeatedly surfaced in organized crime investigations. Brown is an old friend of Reid’s, and in 2006, Reid offered to amend his financial disclosure forms after failing to fully disclose the details of his involvement in a land deal with Brown that netted Reid around $700,000. Meanwhile, the US Attorney’s office in Utah announced Friday that the Department of Justice and the FBI are both investigating Swallow.